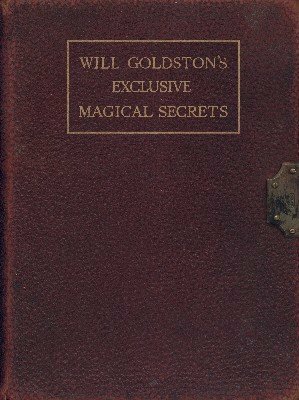 This is the first volume in the famous series of locked books by Will Goldston. He writes in his introduction about his motivation to publish this book: "My aim from the beginning has been to gather together from all sources everything new and big in magic that has not been fully explained before." And indeed we have contributions from the finest magicians living at that time: Chung Ling Soo, Harry Houdini, Servais Le Roy, Conradi, Chefalo, Oswald Williams and Chris Van Bern and others. And don't forget that Goldston himself was a prolific inventor of illusions, many of which are included in this work. The contents spans the whole gamut of magic from pocket tricks, mentalism, and comedy to large stage illusions. One of the crowning revelations in this volume is Buatier de Kolta's Expanding Cube Illusion which is the basis for the famous Origami illusion. 1st edition 1912; original 506 pages; PDF 300 pages. Introduction to "Exclusive Magical Secrets"